I went to the Natural history Museum on Saturday and came across this - lovely axe with nice patina. Aha, this is the hugemongous one from Furze platt. I posted an old pic of this regarding sizes in replicating an Acheulian hand axe topic. It was next too a tiny one from the same site, I think I said any size is authentic! 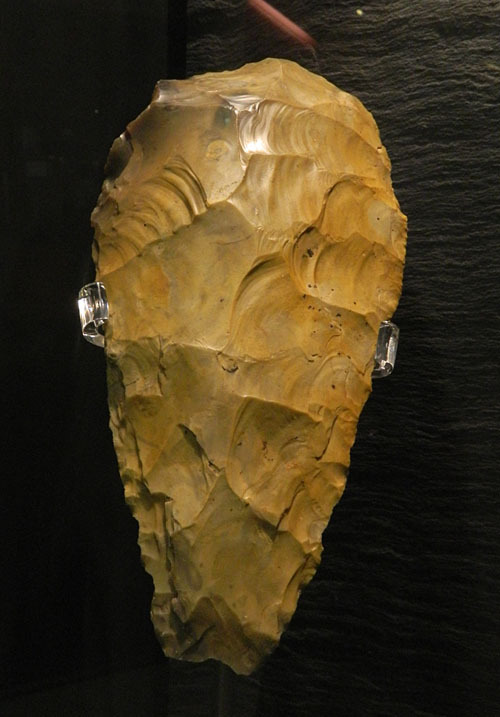 A beautiful piece of bifacial knapping, nice photograph too you really captured the flake scars. It always amazes me how many years of practice it takes for a modern human just to be as good at knapping as a hominid. What always gets me is the size of the flakes that they where able to drive off. The flint colouration comes from its patina. that is the flint has been stained by the soil it has been laying in. If you look centre top you can see a grey patch, the original colour. interesting - thanks for the explanation.